If your life depended on the security and privacy of your Internet connection, would you trust what you are using now? Or would you prefer the same security the US Army uses for all communication classified as TOP SECRET? Did you know that almost all the data you send and receive over the Internet is transmitted unencrypted and can be easily stolen? Spammers, hackers, data thieves, identity thieves and just about all kinds of bad guys simply love it. And yes, this list may just as well include even your own government, your Internet Service Provider or an overly curious boss or spouse. If you are not protecting yourselves, you are an easy prey for them! But what if there was a solution to this problem? A sophisticated, yet easy to use system that would protect the sensitive data you send and receive over the Internet using an encryption technique so powerful that even the US Department of Defense and the US Army is using it for protecting information classified TOP SECRET? Encryption technique so powerful you would need at least a few hundred years to break even with huge computer networks? Encryption technique so powerful that even the best funded intelligence agencies cannot break it? Congratulations: You've just found such a solution. Welcome to IdentityCloaker.com! We will protect you from Internet spies and prying eyes! The technology used to cause you harm is becoming more and more affordable and widespread among the bad guys. What was restricted to intelligence agencies and law enforcement just a few years ago, is now available on the open market. The danger is *very* real and far more serious than you may think. Obviously, we cannot protect you from every possible threat on the Internet. But we will do our best to help you survive the Wild Wild West. And we will do more than that! Do you want to see a website that is normally blocked by your Internet Service Provider (ISP) or network administrator, or that can not be viewed from your country? Do you manage Internet marketing campaigns targeted to specific geographical locations through IP address based content delivery and want to see the advertisements exactly as your potential customers in different countries see them? Identity Cloaker can help you with that too. What is Identity Cloaker *NOT* ? 1. Identity Cloaker is not a "Free Proxy Server Service". Identity Cloaker is not some rubbish free proxy service that hands you a huge list of so called free proxy servers, that are either overloaded, not working, or even infected by viruses and other nasty stuff. We do not rely on rubbish and neither should you! Instead, IdentityCloaker.com operates its own growing network of private servers around the world. It's also important to note that free proxy servers are not usually free at all. In most situations the administrators of the physical server computers do not even know they are running a proxy server. They simply either misconfigured some proxy server software they intended to install for their own needs, or their server had been compromised by a hacker who then installed such proxy server software and probably caused some more evil along the way. There are also reports of some free proxy servers being directly owned by the bad guys. They may be owned by hackers operating on their own, and sometimes even in organized gangs. They use such free proxy servers as a lure that helps them in phishing attacks, gather your web surfing habits, steal your sensitive information sent through such servers etc. The risk is too high! 2. Identity Cloaker is not a "Web Based Proxy Service". Web based proxy services (those websites you visit and enter the URL address you want to access into a form field provided on such a website), are usually Perl or PHP scripts that hide your IP address. To use them, you must change your surfing habits and they do not work in every situation because they have to rewrite the source html code - for example to change image paths. This very often results in problems. Not every page is displayed, or is displayed incorrectly. SSL protected websites (those whose address in the URL bar starts with https://) and websites needing authentication, such as membership websites, work rarely. Web proxies can easily be blocked by network administrators. And even if their domain is not blocked (yet), the transferred data is unencrypted and it's easy for the network admin to recognize what you do with such a service. Imagine a situation when you want to visit a website that's normally blocked. You use web proxy and visit the blocked web through it. However, the network administrator (or your Internet Service Provider, boss, spouse or hacker...) can see you visited the web proxy website - but they can also see what you were doing when using it! They can find out the visited websites and see the transferred data. The consequences could be dire. 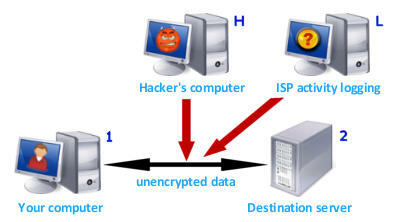 Web based proxy services offer a very low level of safety. They hide your IP address and allow you to access *some* websites you normally could not. But that's about it. 3. Identity Cloaker is not "volunteer dependent". Some anonymity networks and privacy protection services, including the popular TOR, rely on volunteers which results in unpredictable quality of service, usually resulting in very low data transfer speeds and temporal malfunction. Although such services can very often offer a great level of security, they are intended mostly for transferring relatively small amount of data. By design, such services are generally unsuitable for everyday use and for any services with high bandwidth requirements such as streaming radio or video etc. They are also mostly intended for power-users only, their complexity makes it difficult to use for the average computer user. How does Identity Cloaker work? You simply download a small PC software application (no installation necessary), run it, and choose one of our private proxy servers which you would like to be connected through - or simply hit the Connect button if you want to have one selected automatically. When you click the Connect button, a secure data tunnel encrypted with a military class encryption cipher will be created to the selected proxy server. This technique is commonly called SSH tunneling. If you use Windows Internet Explorer, there is nothing more you have to do, it will be automatically set to use the new secure tunnel for all of your web browsing. If you use Mozilla Firefox, you install a small Extension by simply clicking an icon found in the main application window. Then when you restart Firefox, the secured connection will be chosen automatically whenever you are connected to one of the private Identity Cloaker proxy servers. Identity Cloaker works with any Internet browser you prefer, including Opera and Safari. You visit a website - let's call it something.com from your computer, your computer sends a request to something.com and retrieves the data sent back from it. This is actually an oversimplification but generally, it's how it works. The data on the whole path of the communication between you and something.com is normally unencrypted (unless secure https/ssl connection is used). Something.com can easily discover your physical location by reading your IP address. And the part of the communication between you and your Internet Service Provider is vulnerable to data eavesdropping. You visit a website - again, let's call it something.com. The request is sent through the established encrypted secure tunnel to the chosen Identity Cloaker proxy server. This is done in the background - you do not even have to know about it. The proxy server then sends the request to something.com on your behalf, receives the answer and forwards it back to you - again through the encrypted secure tunnel. At all time, something.com was communicating with the proxy server and does not even know about you! The proxy server works as the middleman. For more examples, please take a look at our illustrations at the How it works page. How large is the IdenityCloaker.com network of secured proxy servers? Our network of secured private proxy servers is growing all the time. Currently, we have our servers located in Germany, Netherlands, France, United Kingdom, Italy, Ireland, Sweden, Canada, USA, Poland, Russia, Switzerland, Australia, Spain, Norway, Portugal, Austria and Czech Republic. If there is interest, we may also add servers in other countries and parts of the world too. Our system is very flexible and has been designed to be able to increase its capacity easily, without sacrificing quality of the service offered to our valued customers. Right now, there are 31 servers with 534 IPs in 16 countries in the Identity Cloaker network! We should mention one thing. When we talk about "proxy servers" we mean our own secured private proxy servers. Those are either physical computers or Virtual Dedicated Servers we have rented in several data centers throughout the world. We pay a monthly fee for all of them. They all have 100Mbit+ ports with monthly traffic allowance usually in the terabytes. If you have no idea what that means, it means that we have enough capacity to offer any customer more than reasonable broadband speed of data transfer. We do not rely on some low quality free proxy servers that are almost always oversaturated, overloaded, and may be even infected by malevolent software threatening - not helping, your privacy! Another important characteristic of the IdentityCloaker.com system is that the data transmitted between you and our private proxy servers is encrypted using a military class encryption technique! This is an extremely important feature, not offered even by premium services offering access to private proxy servers. What is necessary to be able to use Identity Cloaker? As long as you can view this page and are using a Microsoft Windows XP, Windows Vista, Windows 7 or Windows 8 computer or run MS Windows XP, Vista or 7 or 8 in a virtualized environment, you should be able to use Identity Cloaker. There are no special requirements, really. Identity Cloaker will work even if you have to access the Internet through an "internal" or company proxy server which is a common situation in some companies and institutions. However, if Identity Cloaker does not work for you for any reason and our technical support is not able to help you solve the problem, we will refund your order without delay. Please see the "Fair Deal Guarantee" info box below. There is absolutely no risk for you! By the way, there is one thing we should mention but it's somewhat controversial... Identity Cloaker does use an extremely powerful technique that allows you to override any web browsing restrictions set on the company firewall level by its administrator. This technique is sometimes colloquially called "punching holes in firewalls". Identity Cloaker creates a secure tunnel connection between your PC and one of the Identity Cloaker proxy servers. Once it is established (through the company firewall), you gain the same web access rights as the Identity Cloaker proxy server itself. And since the proxy server can access just about any website, so can you...and without anyone knowing! For more details about how this all works, please take a look at the How it works page. Identity Cloaker is a very powerful tool, please use it responsibly and with caution! It all sounds a bit complicated, how easy is it to use? Of course, if you do want to know what is going on in the background, or you just love the technical stuff, we have no problem with that either. Just take a look at the How it works page, the Frequently Asked Questions, or contact us through our helpdesk. We will be more than happy to answer any question you may have. UPDATE: Mostly intended for the demanding power users, we now offer also OpenVPN access to all of our (proxy) servers beside of our standard service! The OpenVPN access is currently being offered as a part of the standard subscription service, with no additional fee. So how much does it cost to get access to our broadband secured private proxy servers, super safe surfing through SSH tunneling and OpenVPN backed by 256-bit military class encryption, our own custom-coded Microsoft Windows XP/Vista/7 compatible client software and our exclusive private membership website? Less than €6.67 a month! Yes, that's six Euros and sixty seven Cents - you can use our currency conversion tool to see the amount in your local currency. So again, what are the main benefits of Identity Cloaker? We will protect your privacy! You have nothing to lose. If at any time in the first 14 days after your initial order you feel that you do not need our services, or that the quality of our product does not meet your expectations, simply let us know and your order will be promptly refunded, no questions asked. You will love it or your money back! Deal?